This icon of the “Birth-giver of God”, or in Greek the “Theotokos”, was painted by the famous Cretan iconographer Andreas Ritzos in the late 15th century. After the fall of Constantinople to Islam in a.d. 1453, many of the best iconographers from the Byzantine Empire (the name given to the Eastern Roman Empire many years later) began to work in more outlying areas where there was more freedom from persecution by the Moslems to do this type of work. Crete was one of those very centers of Byzantine culture and tradition, and so Andreas Ritzos worked there for many years. 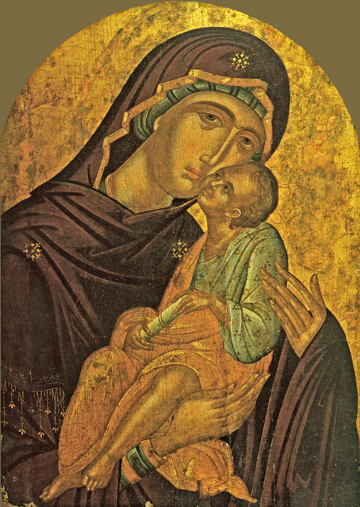 Made in the Sweet Kissing or “Glykophilousa” style, this icon shows the Holy Mother of God leaning towards her divine Son who is pressing His cheek next to hers in a tender embrace, the hallmark of Sweet Kissing icons. Their relationship is filled with outward tenderness and love, yet inwardly it is even more, for the Lord responds most especially to those whose hearts are turned in love to Him and the other Persons of the Holy Trinity, and there has never been another in history to match her in love.